enable industry to easily calculate the potential value of measures. 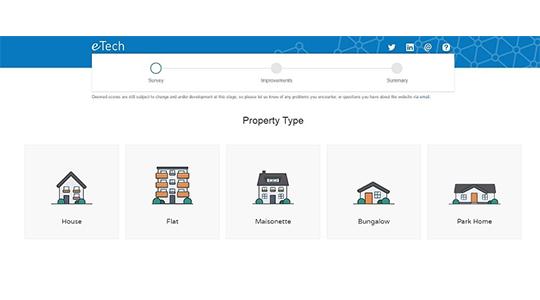 You simply enter the basic property attributes and then select multiple measures to see the associated lifetime carbon and cost scores proposed under deemed scores. Optionally, enter CERO and HHCRO contract rates to also see the associated ECO value of the measures to determine the viability of funding them. “We’re committed to ensuring our customers have the necessary tools at their fingertips to maximise opportunities under the revised scheme and maintain our position as the market-leading software provider for the ECO industry” said Rob Cartwright, Energy Solutions Director at eTech. We’d welcome your feedback on the calculator, please email info@etech.net or call 0333 123 4288. Click here to view an instructional video. Please note that whilst legislation and regulation is finalised for the transition period, deemed scores are subject to change.